Originally uploaded by AJ Wms. What? Me a geek? 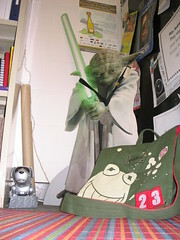 Just because I have eleven (yes, 11) Yoda items in my office as well as my Kermit bag (thanks family!!) along with a variety of other stereotypical references to Muppets, Star Wars, Star Trek, Looney Tunes, dinosaurs, and more? Is that enough to cause me to proclaim geek pride? Next Next post: Convergence of Stuff: When is the right place and device?